Any Container grown fruit trees - Availabity means available for supply now. A guide to selection, rootstocks come in 5 sizes see the chart below, all of our trees are labelled using these codes. Our Crab Apples are grown on the MM106 rootstock. Delivery Charges - The delivery charge is worked out from the weight and the size of the plant. We have several rates that apply to UK mainland addresses. A delivery charge of £8.50 is for all single tree orders. £10.00 if more than one tree except in the case of the Espalier and Fan trained trees where this charge is a maximum of £40.00. The lower postal rates range from £2.80 - £5.70, will be applied to smaller orders of the lighter plants like currants, raspberries, gooseberries, blackberries, asparagus and strawberries although larger orders will go into the £10.00 rate. Once you have put together your order the delivery charge will show before payment. All orders are despatched in one delivery. 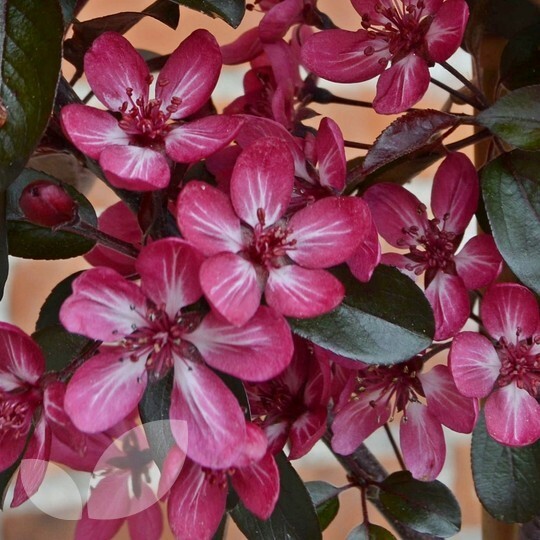 Malus toringo Aros Crab Apple - A stunning dwarf upright tree ideal for patio growing or small spaces. Leaves emerge a shiny dark burgundy to black turning slightly green with age. Bright purple/pink flowers in the spring turn to very dark red/maroon fruits in the autumn. This new variety won the best in show at the HTA national plant show. Great little tree, well packed, fast delivery, excellent communication, would buy from you again! My 2 fruit trees arrived in perfect condition and the couple of queries I had about planting them were answered very swiftly by email. I plan to buy another tree shortly.